Our military gets "volunteered by others." Barack Obama promised he wouldn't lead us into wars as George W. Bush did, and he hasn't: unlike Bush, he's sent our military into Libya without a Presidential speech of explanation, without a Congressional resolution authorizing it, without even clearly telling his generals what our objectives are. Even his core supporters in the leftist media found this worrisome. Enough pressure built up that a few days ago, the President finally gave a speech advertised as an explanation. Alas, he didn't use the usual trappings of the Oval Office, and didn't even give us any details more substantive than "Trust me, I know what I'm doing." We thought Mr. Obama would bring Hope and Change from warmongering! Nobody noticed that Obama did give an explanation for why we're attacking Libya, a perfectly clear one, in a news conference in El Salvador of all places. Finally! Unfortunately, it's not an explanation you're going to like. Our Soldiers Work for Who? First, just so you don't think we're making this up or going with Faux News, here is the article on Obama's very own website, Organizing for America. As he has in previous stops during his trip to Latin America, the President was asked today in El Salvador with President Funes about the ongoing situation in Lybia [sic]. And once again, having spoken at length about the importance of America's relationship with the host country in the context of his vision for strengthened relationships throughout the hemisphere, the President took the time to give a thorough update on developments and give all due credit to our men an women in uniform. Setting aside the humanitarian goals that you just mentioned a few minutes ago, can you articulate the U.S. national security interest in military action in Libya? Wait, what? Our military is being volunteered by others?!?! Now, there's nothing at all wrong with helping out our allies - that's what alliances are about. If Barack Obama had said, "England helped us in Afghanistan, it's only right that we give them a hand in Libya," we might not like it, but we'd agree he had a point. It's not necessarily wrong to take out bloodthirsty dictators either, especially ones with a proven history of murdering innocent American civilians. If Mr. Obama's bombs turned Qadaffi to jelly, we'd stand up and applaud him for accomplishing what Reagan tried and failed to do. If we tried to overthrow Gaddafi by force our coalition would splinter. We would likely have to put US troops on the ground to accomplish that mission or risk killing many civilians from the air. To be blunt, we went down that road in Iraq... but regime change there took eight years, thousands of American and Iraqi lives, and nearly $1 trillion. That is not something we can afford to repeat in Libya. Fair enough. President Reagan thought eliminating Libya's dictator was too pricey back in the 80's and it's only gotten more expensive since then. If that's the case though, if eliminating Gaddafi would cost to much, why are we bothering at all? It's not like we have money to burn just now: Europe, and not us, is dependent on Libyan oil, and if they want to fix their neighbor's problems they should learn to do it themselves. No, as our Commander in Chief has plainly and publicly stated, "Our military has been volunteered by others" that didn't feel like paying the the full cost in their own blood and treasure, to explicitly not accomplish the only possible worthwhile goal, and do something which at best will benefit the United States not one whit. 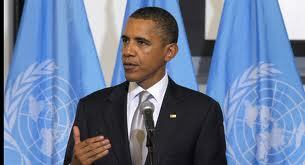 At worst, we've helped our enemies: many of the Libyan rebels are al-Qaeda, as even Obama himself admitted. There's a word for an army that works for others regardless of what might be in their own country's best interests: mercenaries. Our American soldiers didn't volunteer to be someone else's mercenaries; they didn't volunteer their own lives simply to get volunteered by the U.N. When the body bags start coming back - and they will - Obama won't even be able to tell the grieving parents that their son died to remove a monstrous tyrant, as Bush was truthfully able to do. And at least smart mercenary generals make sure their army is well paid by whoever's using it. Obama's providing our military services free of charge. It's too bad our media didn't pay attention to what the President said in El Salvador. No wonder we're tens of trillions of dollars in the hole! Help out our allies, hah! He's more likely to help out Iran than England. Hobbes, this is very true. But I'm curious. Had Obama said "England helped us in Afghanistan, it's only right that we give them a hand in Libya" would you then support him? Like I said, "we might not like it, but we'd agree he had a point." Odds are I'd sit that one out and not come down hard on either side, primarily because I don't think bombing Libya is actually going to work or help the Brits much either. In a situation with a better chance of success, yes, I'd support helping out a loyal ally. Petrarch excoriated Obama for not siding with the Brits about the Falkland Islands, another place where we have no direct American interests whatsoever but which means a lot to England. To be fair, the last British PM wasn't any more faithful to us than we've been to them of late. So the comparison isn't necessarily spot on.